So many games, so little time. From Resident Evil 2 to Kingdom Hearts 3, January was packed with new games. Now, we’re about to see another amazing lineup of new games in February, so you’re going to need to squeeze a bit more playtime into your schedule. Here are the hottest 10 new games in February that you can look forward to playing very soon. Kicking off the new games in February lineup and already released on PS4 and Xbox One, Ace Combat 7 Skies Unknown is set for launch on PC. Step into the cockpit of the most advanced warplanes. This is the most intense Ace Combat title yet. The unique combination of meticulous realism and a gripping story will immerse you in Ace Combat’s alternate world. Every plane in Skies Unknown is as photorealistic as the clouds you’re flying through. Combine that realism with the characters and challenges in the campaign mode, and you’ll be on the edge of your seat the whole time. Although the final release is in March so technically not part of the new games of February lineup, gear up to try out the beta version of The Division 2. This eagerly awaited sequel promises to be an even bigger and better action-RPG than the first game. The Division 2 takes place in the same post-apocalyptic scenario, but the setting is now the U.S capitol of Washington D.C. Seven months have passed since the events of the first game, and the snowy wastes have changed to a swelteringly hot urban wasteland. Whether you group up with others or try to survive alone, there’s promised to be much more endgame content in The Division 2. This second expansion for Civilization VI adds 8 new civilizations and 9 new leaders to the base game. In addition, a wide variety of new units, buildings districts, and 7 new world wonders will also be added to your experience. Everything about the new additions in Gathering Storm is designed to make the game feel more alive and more real than ever before. If you’re new to the Metro series, then prepare to experience an epic first-person shooter adventure. This newest title will have you fleeing the ruins of post-apocalyptic Moscow in search of a new home for you and your fellow survivors. Inspired by the novels of Dmitry Glukhovsky, you’ll journey through the city’s surrounding wastelands and wilderness. The seasons will change in-game, and so will you by the end of your mission. This is definitely one of the new games in February that you don’t want to miss! Legendary Nintendo developer Shigeru Miyamoto once said: “A delayed game is eventually good, but a rushed game is forever bad”. The team behind Crackdown 3 seem to agree. According to developer Microsoft, all this extra time working on this long-awaited game will be worth it. So prepare for another satisfyingly chaotic romp through an open-world city that’s as detailed as it is destructible! Jump Force is what happens when you combine the most powerful and iconic manga heroes into one game. Create your own superhuman warrior and fight alongside some of the greats from Naruto, Dragon Ball Z, Bleach, Yu-Gi-Oh!, and more! The battleground will be Earth, and the fate of humankind is at stake! Now, 17 years have passed and society has begun to rebuild. But there are two groups (and two violent warlords) with very different perspectives in Hope County. It seems the apocalypse was only the beginning of your problems. This is the Yakuza game that started it all. Enter a crime world governed by hard work, respect, and dedication. A world where you, a young gangster trying to build his reputation, has just taken the fall for the murder of a well-known crime lord. In Yakuza Kiwami you’ll begin your journey as you emerge from prison as a changed man to a changed world. There are so many things to do in Yakuza Kiwami, and so much potential to rise up the ranks as a dedicated Yakuza. Developed by legendary storyteller BioWare, the long-awaited Anthem is almost here. 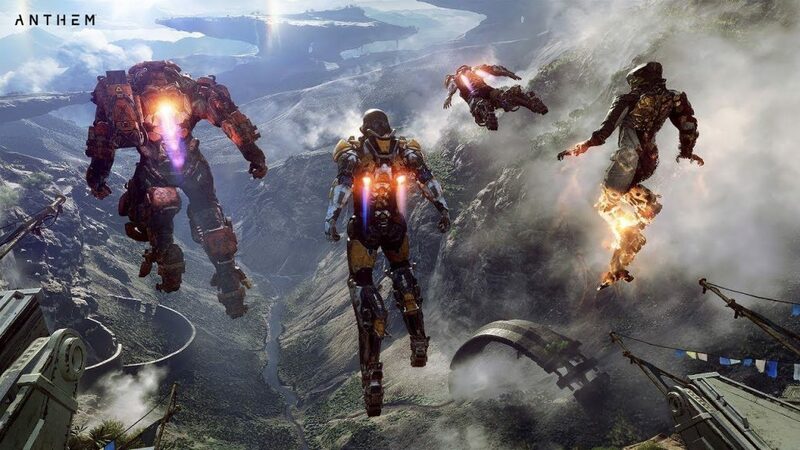 Anthem is a third-person multiplayer shooter in which players will explore an open world filled with exciting missions, public events, and compelling storytelling. It’s a mysterious world, where the Gods have vanished and monstrous creatures remain. You and a handful of other “Javelin” Exosuit pilots are humanity’s last hope. Unlock the mystery of “The Anthem”, the source of all creation, and harness the power of the Gods. Last but not least in the new games of February lineup – take on iconic rally tracks from around the world in the most powerful off-road vehicles available. Dirt Rally 2.0 is all about trusting your instincts and controlling the road. With more than 50 vehicles to race across 6 real-life courses, this is the ultimate rally game. When you think you’ve built the perfect team (including staff) and tuned your vehicles for maximum performance, then it’s time to take your skills online to compete in worldwide events. Which of these new games in February do you want to play most? Let us know in the comments below!